(Al Hartmann | The Salt Lake Tribune) Mayor Jackie Biskupski outlines next year's city budget at a press conference in Salt Lake City Monday April 30. She requested more money for more more street repairs and maintenance and more police officers on the street. 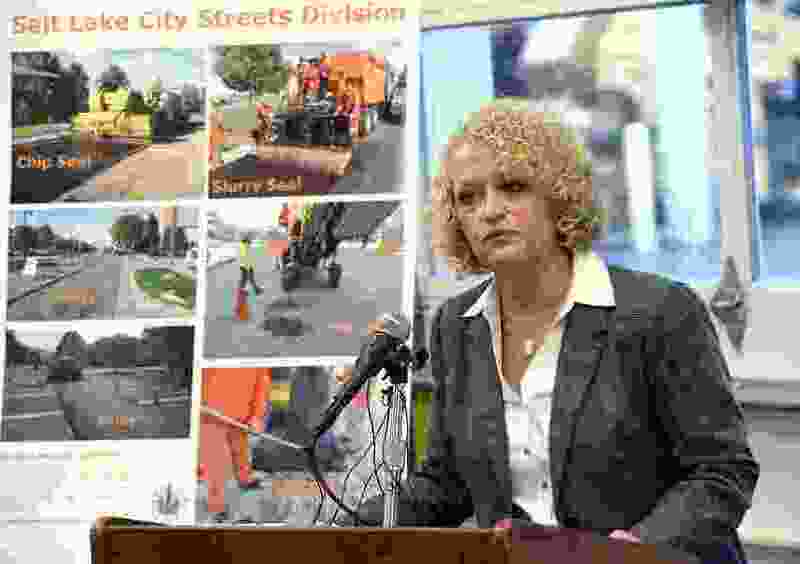 Salt Lake City Mayor Jackie Biskupski’s proposed $275.5 million city budget for next year now awaits City Council action on authorizing a half-penny sales tax increase to net an additional $25 million for more police and affordable housing, along with improved transit and roads. The mayor released her fiscal year 2019 spending plan Monday with a separate blueprint for how the extra sales tax revenue would be spent. The council is scheduled to vote on the tax increase at its meeting Tuesday and is expected to approve it. Public surveys and outreach by the city have registered broad public support for the programs the new tax dollars would fund. The basic general fund budget for the fiscal year that begins in July represents a one percent increase in annual spending. It cuts $2 million in departmental spending but adds $1.7 million for employee health care — a 7 percent increase — and $700,000 more for full-year funding of salary and benefits for employees hired this year. The mayor also budgeted a three percent raise for city employees, which she said kept pace with inflation. Specific onetime allocations include $370,000 to clean up parks, trails and open spaces to remove debris from homeless encampments that sprang up as a result of the Operation Rio Grande anti-crime initiative, which pushed homeless populations out of the city’s downtown to adjacent areas. Public Safety: $6 million, including $2.5 million for 27 new police officers and their equipment. Potential for 23 additional officers, per City Council authorization. Roads: $7.1 million, including $2.9 million to double annual street maintenance capacity to 155 lane-miles. An additional $87 million for street reconstruction could be spent via a voter-approved bond. Affordable Housing: $4.1 million in incentives, rental assistance, and other subsidies to fund 400 housing units. Transit: $5.3 million, including $2.5 million for new full-week bus service on 2100 South, 900 South, 200 South, and 600 North or 1000 North. Service to start August 2019. $2.5 million required to be set aside for reserve. The mayor’s recommendations for spending the additional sales tax revenue reflect the outlays the city has touted in its public outreach, adjusted for partial year collections in the first year. If approved by the council Tuesday, the tax would go into effect in October. 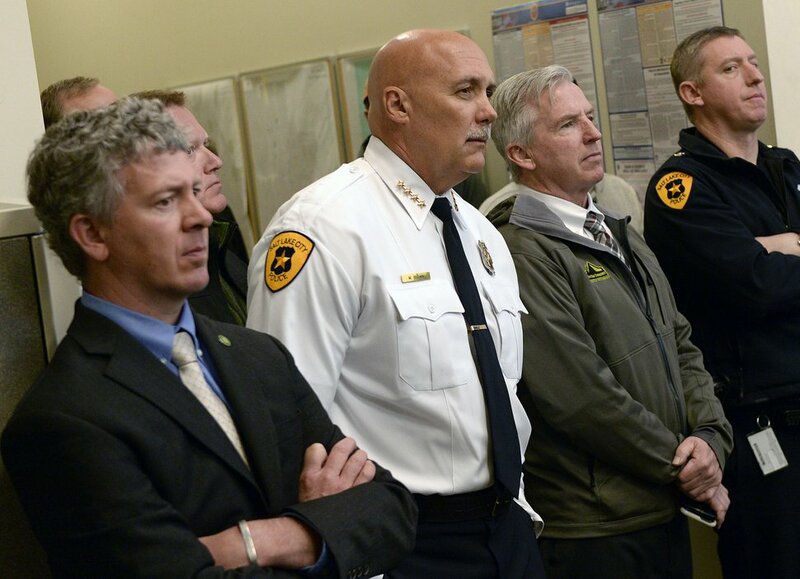 (Al Hartmann | The Salt Lake Tribune) Police chief Mike Brown, center, listens to Mayor Jackie Biskupski's outline for next year's city budget at a press conference in Salt Lake City Monday April 30. She requested more money for more more street repairs and maintainence and more police officers on the street. With a required 10 percent set-aside for reserves, the city would spend $6 million more on police, including hiring the first 27 of 50 new police officers; $7.1 million on road repair, including a new maintenance crew to double repair capacity; $4.1 million in affordable housing incentives that could create more than 400 new homes; and $5.3 million for transit, including new and expanded bus service on major east-west routes. Seeing the mayor’s specific plans for the new revenue “gives the council a stronger idea of how the administration will execute” and “more confidence to make these specific decisions about where the sales tax revenue will go,” City Council Chairwoman Erin Mendenhall said, reacting to the mayor’s proposal. The half-cent tax increase, equal to a nickel for every $10 spent, would bring city sales tax to 7.35 percent. Sixty percent of sales tax revenue is paid by tourists, commuters and other non-city residents. An additional quarter-percent sales tax increase to fund transportation might occur if cities representing a two-thirds majority of Salt Lake County’s 1.1 million residents vote to authorize it by June 22. That potentially means a sales tax of 7.6 percent for the capital city. The mayor on Monday said there “is a lot of work that has to be done countywide” for that tax increase to go through. Meanwhile, public support shows that city residents have opted “for a tax increase that stays within the hands of the city,” she said.